This post originally appeared on Kyle Davis’ Medium. Have you heard? Redis 4.0 is out. That means modules. Not just in the theoretical, shouldn’t-run-in-production sense. It means primetime. Throw’em on your production server and go. Note: Redis (the database) and Node.js (the JS runtime) both use the term “module” for different concepts — the language herein has to be a bit laboured to be clear and differentiate. During RedisConf 17, a preview demo of a clustered implementation of RediSearch was shown that has indexed over a billion (yes, with a b) documents at 100k documents/sec. 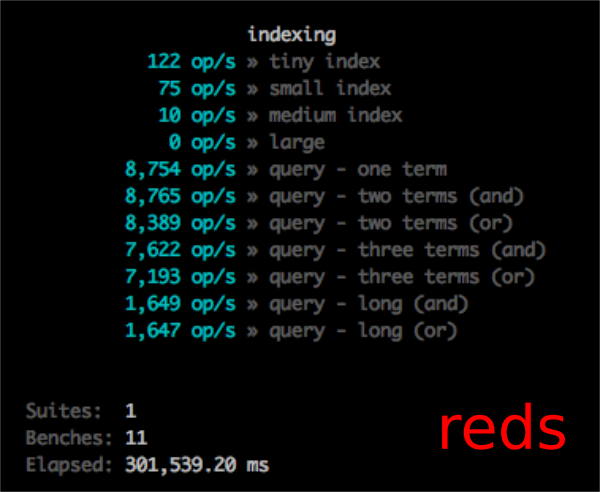 With the exception of the metaphone indexing, RediSearch has everything Reds has and a ton more. My goal was to see if I could map out the Reds functionality to RediSearch and create a (more-or-less) syntax compatible Node.js module: RedRediSearch. The syntax compatibility would allow the existing users of Reds to do a fairly painless rip-and-replace. Unfortunately, you’re not going to be able to just point RediSearch at the Reds data and magically gain performance, you’ll need to re-index your data. RediSearch is a Redis module that uses a different (and, frankly, more efficient) custom data type, as compared to Reds that uses native zsets. Aside from that, it’s painless. And indexing is pretty quick as you’ll find out. The “natural language processing” functions can’t map over, although you will likely not need it or it can be achieved through a few tweaks to your index (I’ll cover that later). The other thing is that creating an index is not conceptually the same — in Reds reds.createSearch only prepares Node.js for accepting data. In RediSearch, however, creating an index is an actual Redis call (FT.CREATE) and consequently needs a callback. Aside from that, searching and indexing are the same syntax. Adapting a few of my scripts were as easy as just 3–4 lines of adjustment. I also added a function to confirm the existence of the module. I’m just that nice of a person. What do you get from RediSearch over Reds? You get better performance. Running the Reds benchmark over the same data on the same machine, I’m getting between a 6.6x and 13x better performance out of RediSearch over Reds while indexing (depending on the size of the documents). Querying is faster too — between 1.2x and 7.4x faster. The whole benchmark is completing 12x faster. That’s a huge improvement for a drop-in replacement. This is on a modest laptop with a stock, non-tuned install of OSS Redis. The other thing you gain by switching to RedRediSearch is a richer, more flexible query system. Reds had the ability to do two types of search: AND and OR. That is, you could only query a document that had one of the query keywords or all the query keywords. Useful, but not very flexible. And probably more features that I’ve yet to fully understand or discover. The idea with the suggestions is to maintain the suggestion list based off the queries coming into your search, adding results that aren’t search misses. When a user starts typing, the auto complete can be fetch asynchronously from the backend and presented to the user as they type. RediSearch is indeed a very full toolkit. Earlier, I mentioned that you can make use of more than just what is contained in the Node.js module. Node_redis has the capability to send commands directly to Redis and it’s very useful when needing some special parameters and, boy, does RediSearch have extra parameters. Reds and RedRediSearch are effectively just wrappers sending commands directly to Redis. You can absolutely use them together if a feature doesn’t exist (yet) in the Node.js module. This would create a two stop words — ‘bunny’ and ‘rabbits’ that would be ignored entirely. So, if a feature is not yet supported, it’s easy to break free from the existing confines and leverage the full power of the RediSearch module. First you need to install Redis 4.0 (if you don’t already have it) and then the module. I’m using 0.19.3, but check on RediSearch.io or the github releases page for the latest version. This should yield a directory called /RediSearch-0.19.3. Switch into that directory and we’ll make everything. Your path might need to be tweaked if you decompressed the tarball in different place or used a different version, but the most relevant parts are the file (redisearch.so) and the last directory (src). Should I switch from Reds to RediSearch? Generally, I would say “yes, absolutely.” However, you may need to hold off. If you’re using open-source Redis and your data fits into a single instance — go for it right now. If you’re using Redis Enterprise Pack, you’ll need to be a little patience as they are putting the finishing touches on RediSearch + Redis Enterprise Pack, which will enable indexes that span across your entire cluster (think of the possibilities!). 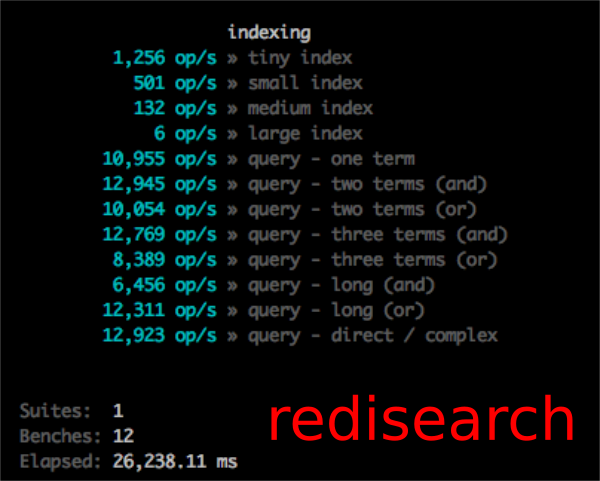 If you’re using Redis Enterprise Cloud, stick with Reds as the modules and (consequently) RediSearch isn’t available. However, this will be an option soon with Redis Cloud Private, so stay tuned for that. In all these situations, [Red]RediSearch or Reds, you’re covered because your app-level logic will stay the same. Hopefully RedRediSearch will continue to evolve to encompass all the features of RediSearch as well as maintain backwards compatibility with the Reds syntax. You can pick up the module on Github or through NPM. Explore Redis Enterprise at our brand new website — redislabs.com — and experience the fastest and most prolific database in the world! Redis Labs is the home of open source Redis and commercial provider of Redis Enterprise — the world’s most popular in-memory database platform.